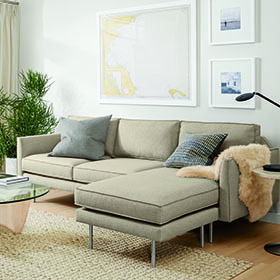 From a distance, you'll appreciate how seamlessly our new furniture works in any space. Up close, you'll love the precise tailoring and stitching, the smooth feel of hand-sanded wood, and the durability that comes from thoughtful attention to every detail. Flange seams and a unique angled back panel give the new Anderson sofa a casual yet tailored feel, while the stainless steel legs lend a contemporary edge. 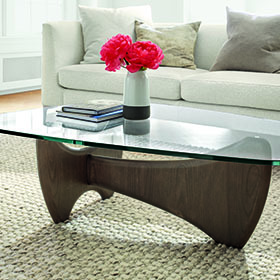 The sculptural shape of the new Sanders table is inspired by mid-century design. A tempered glass top showcases the distinctive base from any angle. 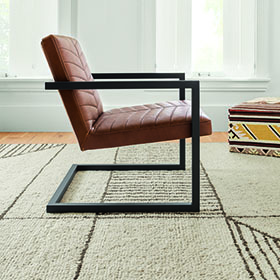 Featured on our new Ryker chair, a stitched chevron pattern lends a vintage feel to a seat that appears to float in its steel frame. The light and airy silhouette helps rooms feel wide open.